I'm now participating in both a decluttering blog hop with The Snyder 5 and a 28 Day Organizing challenge with The Organizing Junkie. That's a lot of organizing! 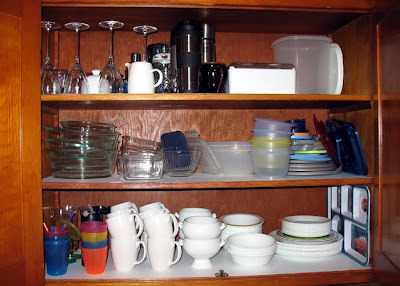 So last night, I thought I'd better get started by decluttering and organizing my dishes cabinet. Our dishes cabinet sits to the right of our kitchen window (and sink) and directly above our dishwasher. Convenient? Yes. But our kitchen is so small that all of our cabinets are "conveniently" located. 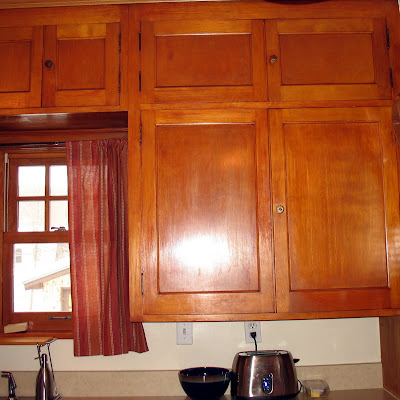 In fact, our dishes cabinet is one of only two large upper cabinets in our whole kitchen! As you might guess, the other one sits to the left of our kitchen window (and sink). Above is the "before" picture. I will admit that it's not horrible. We've all seen cabinets that appear to have suffered a Tupperware explosion. 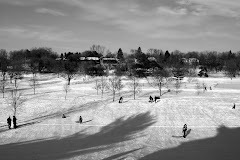 Still, there was significant room for improvement. Too much stacking/blocking: I can't tell you how many times I've knocked stuff onto the floor while searching for a buried lid or reaching for a precariously placed travel mug. To keep my sanity (and avoid head and toe injuries), the stacking and blocking had to be minimized! Mismatched food storage pieces: Why can I never find the covers for my tiny food storage bowls? Seriously, where are they? I give up. If it doesn't have a match, it doesn't belong here! Infiltration of entertaining pieces: A wine glass here, a cream pitcher there. For some reason, our entertaining pieces seem to infiltrate this cabinet and block our more frequently used items. If an item doesn't get weekly use, into a higher cabinet or basement tote it must go! Does this item belong in a cabinet filled with things related to serving or storing foods and beverages? Does this item get used on a weekly basis? Does this item have all of the parts necessary to be functional? Items that generated a "yes" to all three questions went back into the cabinet. 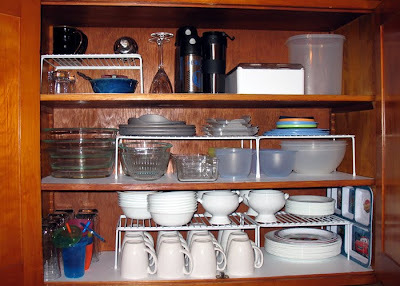 I also bought some inexpensive kitchen cabinet organizers to cut down on the stacking. Now, my food storage lids sit directly above their corresponding containers! Ah, it's the little things that bring us peace, isn't it? 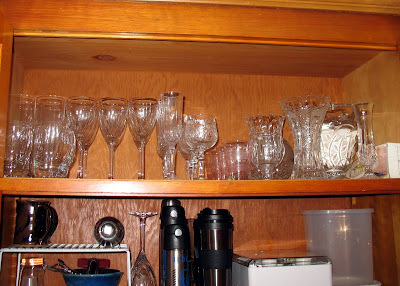 I kept a couple of drink and wine glasses (and accessories) in the lower cabinet, but the rest went back into the smaller glassware/crystal cabinet above. Now maybe I'll be more eager to empty the dishwasher!